The Beginning: Helene was a caterer living in New York City when one day her roommate announced she was moving to LA and she should come along. Arriving in LA, Helene continued working as a caterer and as a personal chef. Word spread--her food is that good--and soon a few local Malibu women asked her to teach a cooking class. She began teaching classes using the produce from her own garden and hosting weekly dinners at her home. Before long she asked the owners of Malibu Pier if she could serve dinner there once a week, eventually expanding to three nights and changing the décor from its former incarnation as a Ruby’s chain with red plastic seats to the clean lines and blue and white décor that have become an Instagram darling. Malibu Farm Pier Cafe serves breakfast and lunch daily and is open till 8 PM Friday-Sunday. Order at the counter and grab a seat inside or better yet, outside. Looking for something more sit down? Book a table (walk-ins only until 4:30 PM) at the new Malibu Farm Pier Restaurant and Bar, located at the beginning of the pier, a table service restaurant that’s also open for dinner. Farmers Market: When she started the business, Helene got everything from her own garden, but as her business grew she became a regular at the Santa Monica Farmer's Market, loading up her Prius with the daily produce. Today she still handpicks everything at Larry Thorne’s Family Farm, Maggie’s Farm and on Wednesdays at the Santa Monica Farmers Market. Favorite Bite: One of my must orders at Malibu Farms is the cauliflower pizza. Helene shared the creation of this dish, demonstrating how much love and attention she puts into each recipe. “ So it all started with a cauliflower lavash pizza that everyone asked if it was…you guessed it…gluten free! After hearing this question repeatedly I decided to experiment and develop a gluten free crust that would be both easy to eat and delicious. It took about two months to create one that didn’t taste like cardboard.” If you’re lucky enough to visit Malibu, stop by and try the pizza--you can taste the long hours of labor Helene put into the recipe! Big News: Next on Helene’s already busy plate is a very exciting expansion project with her Malibu neighbor Nobu, known the world over for upscale sushi. (The Nobu Malibu is an LA hot spot as well, serving their signature Japanese-Peruvian fare in a stunning beachfront setting.) In the last few years, Nobu has begun venturing beyond the restaurant business into the luxury hotel realm. (Their first U.S. hotel was in Las Vegas inside Caesars Palace.) Malibu Farm will open beachside alongside Nobu in the soon to open Eden Roc Miami and in Cabo San Lucas, Mexico. Imagine having Helene’s cauliflower pizza and brussel sprout salad for lunch and Nobu’s yellowtail and jalapeno for dinner without leaving your hotel- a match made in heaven! Helene never dreamed anything like this could happen back when she started renting space one day a week at the pier. There’s More: Malibu Farm is available for private parties. With the waves crashing below and the dramatic ocean views it’s a perfect spot for a special celebrations such as engagement parties, baby showers or birthday gatherings. Cook the Book: If you want to recreate Helene’s dishes at home get the Malibu Farm Cookbook here. This has become my standard gift—I buy it for everyone! Cook’s Night Off: On a rare day off, Helene loves to relax at home in Malibu. On the rare occasion she takes off her apron and ventures out she loves Gjelina, Gjusta, and Republique. Keep your eyes open for Nobu Ryokan, a boutique 18-room property overlooking the ocean on the PCH. Located just a few yards away from the Nobu Malibu restaurant and the Malibu Farm, we expect this will be a hard reservation to come by when it opens. Until then check in to the Malibu Beach Inn, a 3-minute walk from the Pier on Carbon Beach. 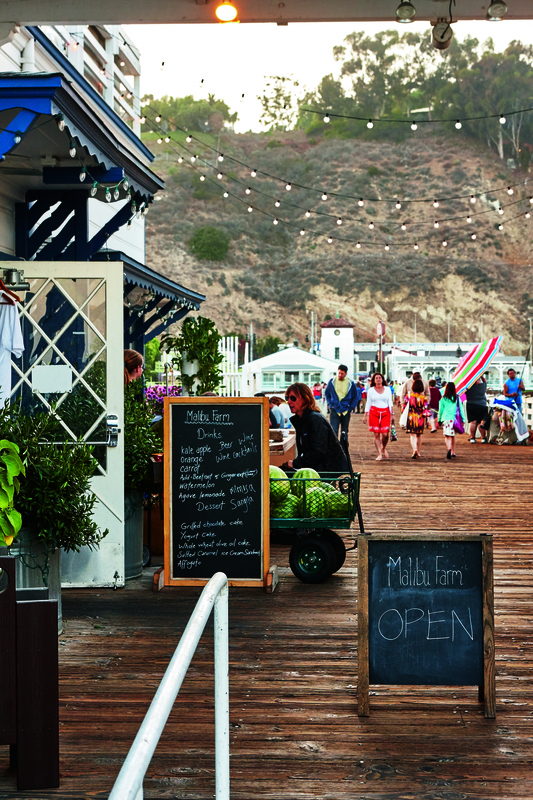 The Malibu Country Mart and Malibu Lumber Yard, a large outdoor shopping mall is just down the road from the Pier. Don’t miss this casual shopping oasis with a mix of upscale boutiques, art galleries and restaurants.